How do I Install Vent Pipe for Downdraft Stove? Once kitchen countertops are updated, one of the final steps to completing the kitchen's work surface is to install a countertop cooktop. Instead of the standard top surface of a stove and oven unit, an opening is cut into the countertop and a cooktop unit, separate from the oven, is set into it. With the opening cut to the right measurements, installing a countertop cooktop is a simple process. Turn the new cooktop over and lay it on a flat work surface to expose its connections. 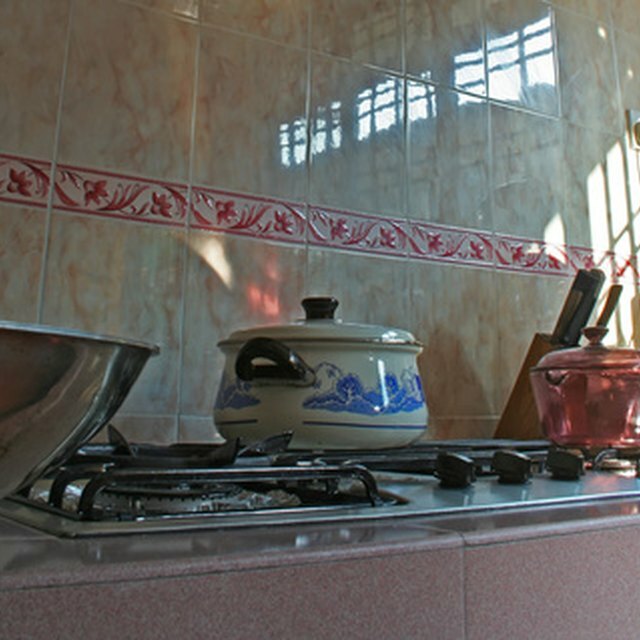 Apply pipe tape or sealant around the threads of the gas line connection if it is a gas-powered cooktop. Twist and tighten the regulator onto the gas line connection with a wrench. Insert the gas line into the exposed end of the regulator, and tighten it using the wrenches--one to grip the regulator and one to tighten the pipe fitting. The gas line is a flexible hose that will connect the cooktop to the main gas line connection under the countertop. Check the electrical connection of the cooktop. The gas cooktop will have an electrical cord that powers the unit. There is usually nothing to do with it, but examine the cord for any defaults. An electrical cooktop has a power wire that emerges from the underside of the cooktop. It is hardwired to an electrical junction box located on the wall, under the countertop. Check that the wires are not defective before continuing with the installation. Test the fit of the cooktop into the countertop. Have the opening professionally adjusted if the cooktop does not have a snug fit in the hole. Remove the cooktop, turn it over and apply an even bead of fire-proof silicone sealant around the underside of the counter's edge. Align and lower the cooktop into the countertop opening. Avoid shifting the cooktop to keep the sealant in place. Press the cooktop down to form a tight seal. Tighten the brackets underneath the cooktop with a screwdriver or drill. These brackets overlap the bottom of the counter and secure the cooktop to it once they are tightened. Connect the gas hose to the gas line. Wrap pipe tape or apply pipe sealant to the gas line connection. Tighten the gas line hose with a wrench. Turn the gas line valve on, and check for any leaks at both ends of the hose. A leak may indicate a loose connection or a faulty hose, so correct this problem immediately. Connect the electrical connections from the cooktop to the electrical supply. For a gas cooktop, plug its electrical cord into the plug located under the counter. For electrical cooktops, turn the power off at the electrical box, connect the wires in the junction box with electrical caps or tape and replace the junction box cover. Turn the power back on, and test that the newly installed cooktop works. Turn off the gas and electrical supply before installing the countertop cooktop.